Alcoholic fatty liver is a medical condition which occurs due to excessive consumption of the alcohol. Prolonged exposure to toxic substances from alcohol eventually leads to accumulation of fat deposits in the liver. This medical condition typically features with abdominal discomfort, jaundice and weakness. In case it has occurred, the damage of the liver is reversible only if one abstains from alcohol. If not, the diseases tends to progress and further alcohol abuse will also contribute to occurrence of liver cirrhosis or even liver cancer. This is why alcoholic fatty liver is considered as an early and reversible stage of serious liver damage caused by chronic and excessive alcohol consumption. In the USA 90-100% of chronic alcoholics develop this disease. Furthermore, women are more prone to develop severe alcoholic liver disease comparing to men. In women this condition generally occurs more quickly and at lower doses of alcohol. And finally, since the degree of liver tolerance to alcohol is different in young and older people it is clear that this disease occurs more and progresses faster in older people. Accumulation of the fat in alcoholic fatty liver occurs and a consequence of imbalance between delivery and removal of fats. This medical condition basically affects people who drink more than 60g/d of alcohol per day. Alcohol consumption leads to increased hepatic levels of glycerol 3-phosphate. It consequently enhances esterification of fatty acids which results in increased accumulation of fatty acids in the liver. Furthermore, large amount of alcohol induces lipolysis and inhibits oxidation of fatty acids. All the previously mentioned as well as several more processes is responsible for increased accumulation of fats. Alcoholic fatty liver may cause abnormalities which can be found during physical examination of the patient. The disease may also feature with abnormal functional tests of the liver. Hepatomegaly can be easily palpated by well-experienced doctor. This is a common manifestation of alcoholic fatty disease and affects approximately 70% of all patients. Ultrasound of the abdomen is excellent in visualization of the liver enlargement. 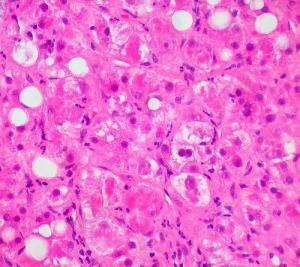 Liver steatosis and definitive conformation of alcoholic fatty liver can be confirmed only after pathohistological examination of the liver samples taken during biopsy. In severe cases of alcoholic fatty liver patients may complain about weakness, anorexia, nausea and abdominal discomfort. Some patients may even develop jaundice. There is no specific treatment for alcoholic fatty liver. The progression of the disease can be successfully prevented if one stops consuming alcohol. This way the liver will be given chance to regenerate and restore its damaged functions. What can we expect after dad is diagnosed with stage 4 cirrhosis of the liver?